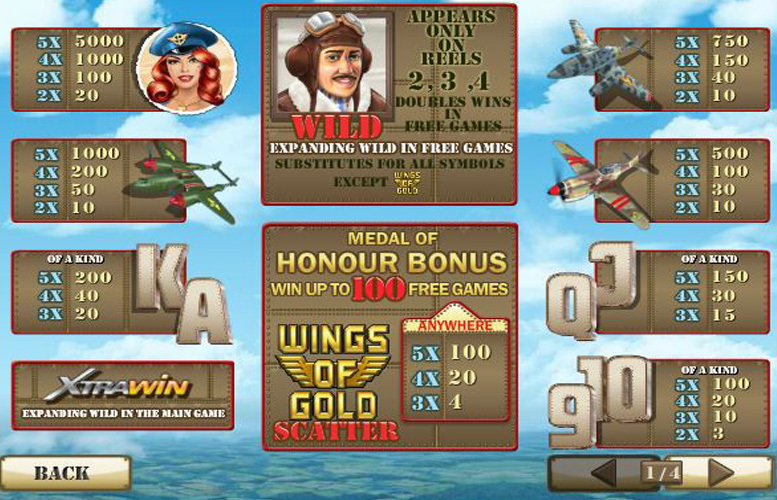 Wings of Gold is a battle of Britain themed slot machine that features a fetching red-headed air cadet, various bombers, fighters, and a plucky, daring pilot. The game also contains a couple of bonus rounds, one of which is fantastic, the other not so much since it costs additional bankroll to activate. One of Wings of Gold’s best features must be its huge upper betting limit, and good-sized prizes. That’s without even mentioning the potential prize of 100 free spins! Massive upper betting limits. There won’t be many players who think the £2,000 per spin maximum wager is too low. Potentially huge free spin bonus. Few machines offer 100 free spins. That’s some serious winning potential. High main game jackpot. 5,000x the win line is a solid amount for a jackpot, and feels fair on this title. Just one standard game feature. It’s a great one but Wings of Gold’s second feature requires additional payment to activate. This is certainly a negative for us. Redhead woman = 5,000x the line bet. Green bomber = 1,000x the line bet. Blue bomber = 750x the line bet. Spitfire = 500x the line bet. 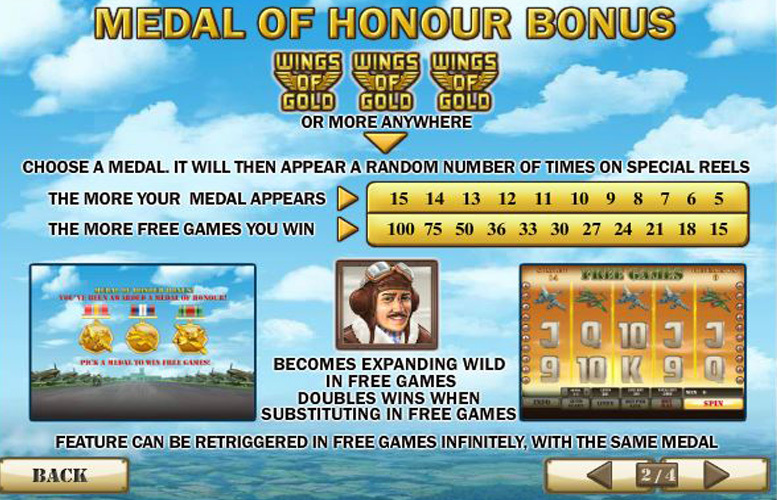 Landing three or more “Wings of Gold” game logos anywhere on the reels will trigger the Medal of Honour Bonus. Players must choose a medal, and it will then appear a random number of times on special reels. The more the medal appears, the more free games are won. The maximum here is a fantastic 100 free spins. The pilot becomes an expanding “wild” in free games and actually doubles all winnings too. This feature can also be re-triggered infinitely, with the same medal originally chosen. XtraWin mode can only be played with 20 pay lines. If the feature is activated when playing less than 20 pay lines, all pay lines are automatically activated. To activate or deactivate XtraWin mode, simply click on the XtraWin icon on the top right corner of the gameboard. It can be activated at any time during the main game. 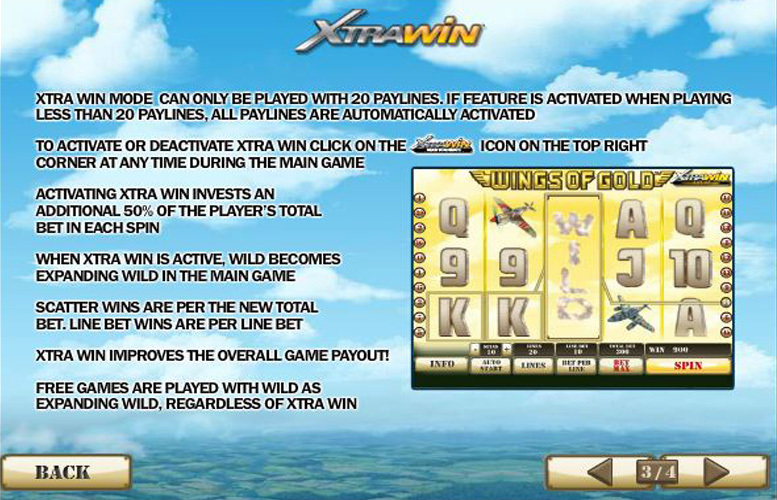 Activating XtraWin invests an additional 50% of the player’s total bet on each spin. When it’s active, “wilds” become expanding in the main game. Scatter lines are per the new total bet, and line bet wins are per line bet. According to the game’s info screen, XtraWin improves the overall game pay out. Ace, or King = 200x the line bet. Players can adjust the bet per line, and the number of lines they bet on too. 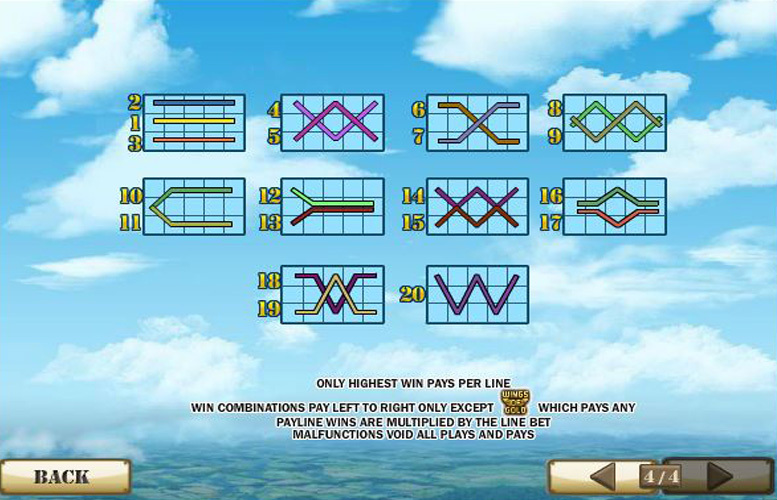 The range of line bets is between 1p and £100, and players can opt to use between one and 20 win lines. This makes the minimum bet per spin just 1p, and the maximum a colossal £2,000. 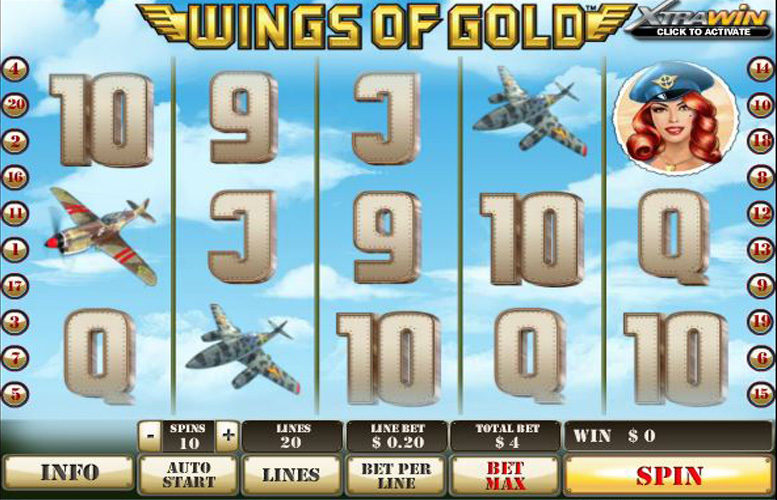 Wings of Gold is a great slot for high rollers who like to bet the biggest amounts. All told, Wings of Gold is a solid machine. Even if it feels a little dated now, the top-heavy wins, and potentially huge bonus features means it retains its enjoyability despite its basic graphic style. We’re not a big fan of the XtraWin feature however. It usually replaces a second free feature on a game, and therefore limits the base gameplay experience. This, plus the older style CGI stops Wings of Glory from being a brilliant machine. It is however well worth a play, particularly for any early aviation fans out there. This game has a rating of 4 / 5 with 411 total reviews by the users.